ink and charcoal on paper laid down on board, 21cm X 17cm. Please compare to his ink drawing „Solacement“ in the section „Figure“. 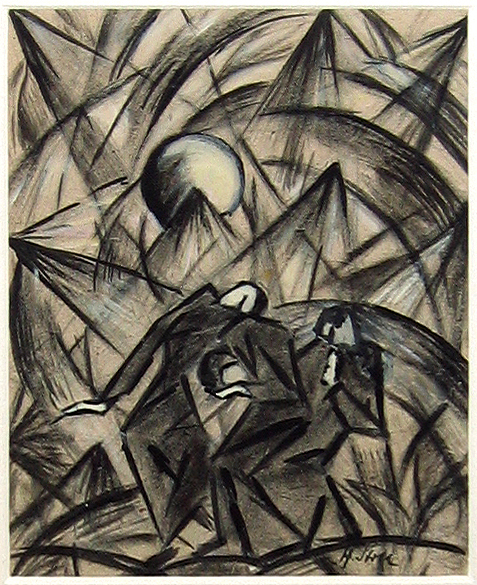 Hanns Stoll was born in 1889 in Schleusingen. He started to study philology in Marburg and continued at the art academy Munich. In the following years he lived in Magdeburg, Schleusingen and during the winter time in Berlin where he kept an attic studio at the Kurfürstendamm 23. He served in WWI and was awarded the „Bair. Verdienstorden 3. Klasse“. Stoll is best known for his traditional landscapes in which he followed a romantic ideal like Overbeck or Caspar David Friedrich. The both drawings of the collection were executed in Berlin and show a quite progressive artistic concept. His studio in Berlin and part of his oeuvre was destroyed in a 1945 bombing. After the war, he lived in Schleusingen and died there after a severe illness in 1949. Lit. : Weitze, Hans-Werner: Schleusingen – Bilder und Notitzen zum Kulturleben seit 1815. Stuttgart, 1981. Naturhistorisches Museum Schloss Bertholdsburg Schleusingen, Typoscript: Erinnerungen an Hanns Stoll.